Many of our readers are relatively new to the world of the iPhone, the iPhone 5 is your first iPhone and it is the first time you do the jailbreak. As we have asked in the comments we will make some recommendations and modifications necessary tweaks Cydia. Needless to say, there are many more, these are the ones I choose and sure you can leave it in the comments and find very good recommendations. I will not recommend tweaks or resource-intensive battery as Winterboard (which lets you put themes), so you see that is missing and you know why. This is one of the first modifications to install it on my iPhone after jailbreak, multitasking for invoking sliding your finger from the bottom of the screen. So far nothing we could not do with Activator, but also allows us Zephyr swipe from the side edges to quickly switch between applications, and not only that, we also leave open applications with a gesture. One of the best applications on Cydia. You can download it for $ 2.99 in Cydia, the find BigBoss repo. You need to have done the jailbreak on your device. LockInfo and let us see several notifications in the lock screen when you have not made ​​Apple (iOS 4). Now you can filter the notifications, see all, only the Mail, only twitter, etc.. You can perform actions directly from your lock screen, preview the included HTML emails, add widgets, manage twitter and more. In the video you can see many of them. You can download it in Cydia for $ 7.99. You need to have done the jailbreak on your device. IntelliscreenX is a modification to the very full notification center, since she can do many things: check the mail, reply, delete, mark as read ... You can also manage your Twitter account or Facebook, even your RSS. Works even with the screen locked and if you pull down the screen have a quick access to functions such as WiFi, Bluetooth, 3G, etc.. SBSettings-style. You can download it for $ 9.99 in Cydia. The find ModMyi repo. Need to be jailbroken. From all I've seen attempts to replace SBSettings this may be the best yet, NCSettings is a widget for notification center allows us to turn on and off WiFi, 3G, GPS , Bluetooth, do respring, etc. very quickly. You see the design is very good (much like SBSettings theme I used: black'd out), and that SBSettings is smaller and much easier to set up and edit, you just have to let down an icon that leads to adjustments . 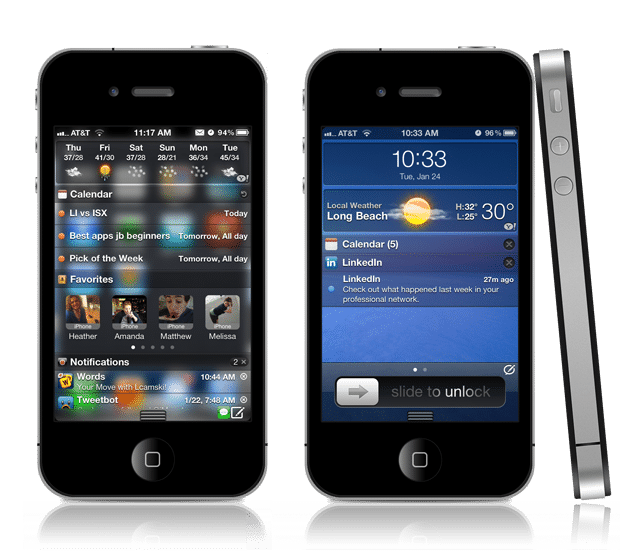 Its size and design make it the perfect companion for the notification center, you're staying with NCSettings or SBSettings? You can download for free from Cydia, you'll find ModMyi repo. You need to have done the jailbreak on your device. Springtomize, the application more complete customization, you can customize many parameters, is the definitive application configuration. Springtomize 2 lets you customize: the animations The dock, status bar, the screen Lock, icons, folders, color, multitasking, sources, notification center and many more. Everything you can imagine. 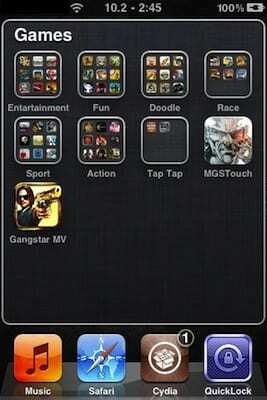 Within it you can find dozens of Cydia applications compiled into one. Besides incorporating a Time Machine where you can store your preferred settings for fast retrieval. You can download it for $ 2.99 in Cydia. 's Find BigBoss repo. Need to be jailbroken. One of the weaknesses of the iPhone 5 is that some applications are not adapted to the screen, and shows two ugly black bars on the top and bottom. This already has a solution: FullForce; stretching modification applications to fill the entire screen of the iPhone 5. Actually stretch is not the right way to say it, but stretching is to adapt, because it distorts nothing. It costs $ 0.99. You can download it in Cydia, in the BigBoss repo. FolderEnhancer adds numerous improvements to the management of folders: open folders faster, be up to 320 icons per folder, create folders within folders, etc.. It is aesthetically less pretty than infinifolders, which does something similar, but has more features. FolderEnhancer can be purchased for $ 2.49 in Cydia. Need to be jailbroken. Article Modifications essential for new users of Cydia was originally published in News iPhone .